This 300-piece puzzle features art from the crowdfunded hit, Exploding Kittens. Great for framing, any fan of the kooky card game will love this puzzle. 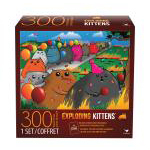 Includes a bonus card for an unfair advantage at Exploding Kittens. Measures 24" x 18" when complete.